Dictionarium Latinum Aegidii Forcellini, in Bibliotheca Universitatis Graecensis servatum. 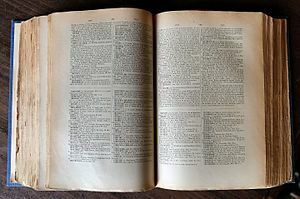 Lexicon (-i, n) aut dictionarium (-i, n), dictionarius, vocabularium, vocabularius aut lexicum appellatur glossarium, liber verborum ac explanationum aut translationum aliarum linguarum. Alia dictionaria explanationes eadem lingua, alia illas altera lingua continent. Etiam dictionaria exsistunt, quae verba picturis explicant. Vocabularium liberum iuxta Vicipaediam Latinam exstat, nomine Victionarium. ↑ Verbum Dictionarium novolatinum est (MCMLXXXI p.C.n.). ↑ Verbum Dictionarius inventum est a grammatico Iohanne de Garlandia circa annum 1230. Dictionarius eius est catalogus rerum mercatorumque urbis Lutetiae. ↑ Verbum vocabularium novolatinum est et ante A.D. MD occurrit. Atkins, B. T. S., et Michael Rundell. 2008. The Oxford Guide to Practical Lexicography. Oxoniae: Oxford University Press. ISBN 9780199277711. Bergenholtz, Henning, et Sven Tarp, eds. 1995. Manual of Specialised Lexicography: The Preparation of Specialised Dictionaries. Amstelodami: John Benjamins Publishing. ISBN 9027216126. Erdmann, Peter, et See-Young Cho. 2008. A Brief History of English Lexicography. Berolini: Technische Universität. Forgue, Guy Jean. 1983. The Norm in American English. Revue Française d'Etudes Americaines, Nov., 8(18): 451–461. Landau, Sidney I. 1984, 2001. Dictionaries: The Art and Craft of Lexicography. Ed. 2a. Cantabrigiae: Cambridge University Press. ISBN 0521780403. Nielsen, Sandro. 1994. The Bilingual LSP Dictionary: Principles and Practice for Legal Language. Tubingae: Gunter Narr. ISBN 3823345338. Nielsen, Sandro. 2008. The Effect of Lexicographical Information Costs on Dictionary Making and Use. Lexikos 18: 170–189. ISSN 1684-4904. Sterkenburg, P. G. J. van, ed. 2003. A practical guide to lexicography. John Benjamins Publishing Company. ISBN 9781588113818. Winchester, Simon. 1998. The Professor and the Madman: A Tale of Murder, Insanity, and the Making of the Oxford English Dictionary. Novi Eboraci: HarperPerennial. ISBN 006099486X. Novissima mutatio die 15 Ianuarii 2019 hora 20:25 facta.